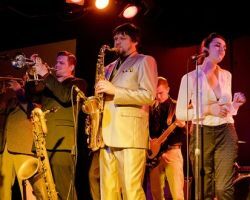 The Georgetown Orbits boast a heavy regimen of traditional ska and soulful reggae. One of the few bands to pay tribute to the golden era of Jamaican ska and reggae music, they will add their bounce to the Moisture Festival Burlesque shows. The Georgetown Orbits have played with such prominent names as the Skatalites, Clinton Fearon, The English Beat, Bad Manners, The Toasters, The Aggrolites, Westbound Train, Chris Murray, Lynval Golding, Pato Banton and The Slackers. 2016 marks the 3rd year the Orbits will perform as the Libertease Burlesque house band, and the Moisture Festival is thrilled to have them.